The pair managed to push higher after the FED meeting last night and spiked up to 1.4446. 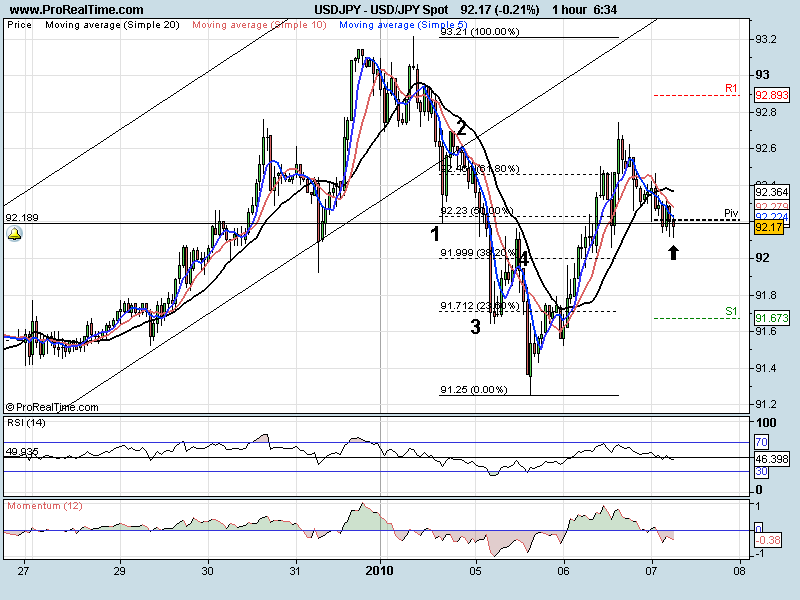 We have since turned bearish and at the time of writing are trying to break the daily Pivot at 1.4373. A barrage of figures out of the Euro zone today at 10.00am http://www.fxstreet.com/fundamental/economic-calendar/ . A break of the pivot opens the way for a move down to 1.4320 and 1.4280. 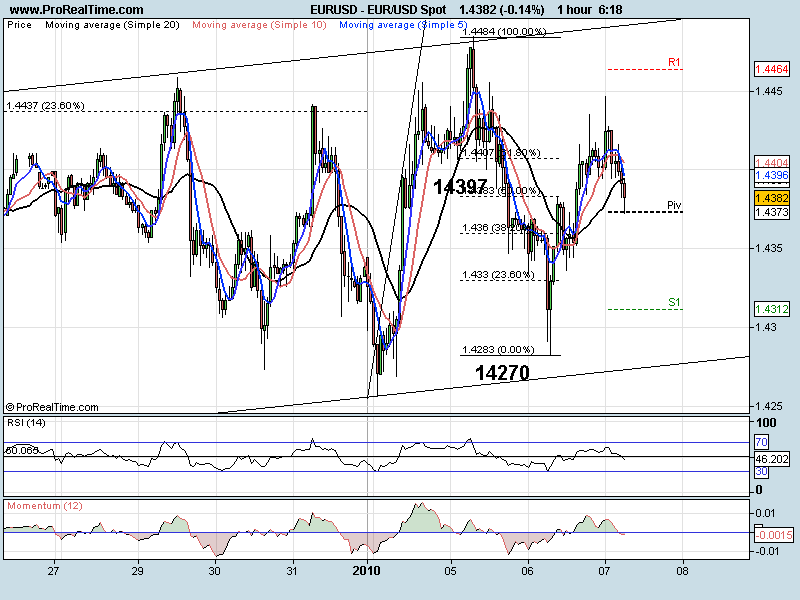 A move through 1.4446 would turn the pair bullish and open the way for the trend line resistance at 1.4491. If we can manage to break the trend line support of 1.4280 we could see new lows with 1.4216 the target area. We broke the descending wedge to the upside after the meeting last night and then move lower to sit on the break out trend line. 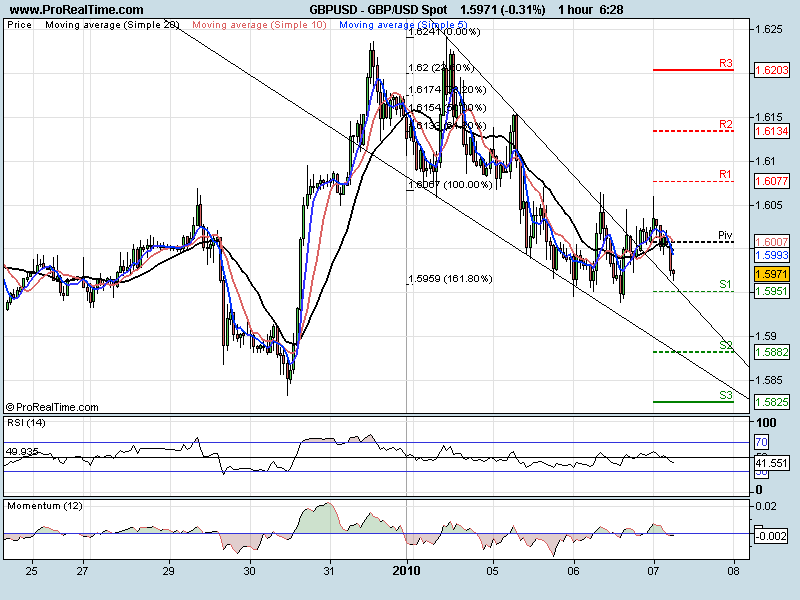 GBPUSD is stuck in a 100 pip range (1.6050 -1.5950). We can’t expect to see any fireworks before the BOE interest rate decision today. I would watch a break of this range to signal the next move. Just sitting on a support area at the moment. All oscillators are bearish but with two spikes emerging in the last two bars we may correct higher from here. If we can break 92.70 to the upside we would open the way for a move up to 93.21 and 93.43. A move below 92.00 and a push to the lows can be expected. USDCHF on the daily chart is holding on the same descending trend line since the 17th of December. Hourly chart shows a move down toward the lower trend line of this large corrective channel. We hit oversold on the RSI and have push higher. We have just met the daily pivot and the 20SMA and are forming a large doji. The next hour should give a better indication of the day’s trend.